It’s back! It’s here! Premier League football has returned! After a summer of transfer madness, national humiliation at Euro 2016 and pretending that pre-season friendlies actually matter, the English top-flight kicks back into gear this weekend. And what a season 2016/17 promises to be. Since the end of the last campaign, we’ve had the addition of world record signings, world class managers and (several) world-renowned egos. 2. …at the start of a press conference in which he does nothing other than talk about Pep Guardiola. 3. The new one-man kick-offs we first saw at the Euros will freak everyone out. 4. Gary Lineker will somehow find a way to present the first Match Of The Day of the season in his pants… without taking any of his clothes off. 5. Every single person in the world will get confused between the EFL Trophy and the EFL Cup. Yes, they are two separate competitions. 6. A disturbing number of tubby, middle-aged men across will start trying to dress like Pep Guardiola. 7. The introduction of Friday Night football will do nothing more than gives fans a new excuse to go to the club on a Friday night. 8. Although the fact Rachel Riley has joined Sky Sports’ Friday night line-up will (inevitably) bring in a few more regular viewers. 9. The first time Paul Pogba misplaces a pass, every football fan on Twitter will make a “waste of money” gag. 10. Arsene Wenger will claim that his side ‘lacked a little bit physicality’ after losing away to Stoke. 11. Hull City fans will reluctantly (and quite understandably) consider switching to rugby league’s Hull FC. 12. Zlatan will be reminded about this clip. 13. Leicester’s Champions League campaign will be described as a “fairytale” more times than you can count. 14. Stormzy will be officially unveiled as Man United’s in-house super agent. 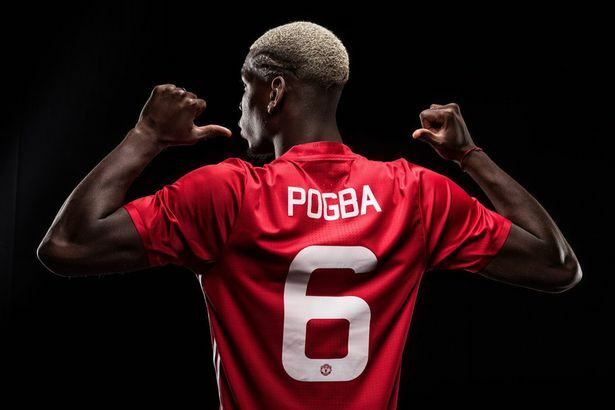 He unveiled the new Man United kit with David Beckham, he basically announced Paul Pogba’s arrival at Old Trafford… why not just give the grime artist a full-time gig? 15. Antonio Conte will threaten to kill one of his players. 16. Harry Redknapp will claim he once tried to sign Paul Pogba while he was Tottenham manager. 17. Sky Sports’ first tweet of an actual Premier League goal will see Twitter explode into a blaze of disbelieving delight. Yes, they are ACTUALLY going to be posting clips of goals on social media. Rejoice! 18. £100m transfer rumours will become routine. 19. No-one – NOT A SINGLE PERSON – will ever fail to spot the new Premier League ball . 20. You will refuse to get accustomed to the new EFL logo . 21. New stricter laws designed to see players booked and sent off for abusing referees will see a couple of games finish 10 vs 9. 22. These new stricter laws will be swiftly forgotten about. 23. Man City fans will sing “Money CAN Buy Us Stones” at Goodison Park. Thus putting a rather cruel twist on Everton fans’ “Money Can’t Buy You Stones” chant from last season. 25. …before quickly forgetting about it. 26. Sunderland manager David Moyes will pretend he’s looking forward to his Old Trafford return. Prepare yourselves, folks. G-Nev is returning to Sky Sports, but will only be doing “guest appearances” on MNF. 31. Lee Cattermole will be booked. 32. Danny Welbeck will finally replace Daniel Sturridge and Jack Wilshere as the Englishman most commonly taunted about his injury problems. 33. West Ham fans will be constantly reminded that they “barely paid a penny for that bloody stadium”. 34. Tottenham will claim Harry Kane is ‘not for sale at any price’ for the entire season (knowing full well that he has a price). 35. Watching Ryan Giggs and Roy Keane doing Champions League punditry together on ITV will become the best thing on telly. 37. West Brom/Stoke/Sunderland fans will express their outrage that Match of the Day has their game on last. 38. Sergio Aguero will suffer a hamstring injury. More than once. 39. Michael Owen will continue his mission to teach the British public that ‘there’s only one statistic that counts, and that’s the scoreboard’. 40. And finally… someone will lift this thing in May.